Okay, I am really really excited about this giveaway because one, I really like this company and two, these shoes are beyond adorable. Matisse Footwear generously sent me a few different pairs to try out, and these were my favorite of the bunch. So beautiful, so perfect for a night out...and I'm so happy that one of you will get a pair of your own, too! 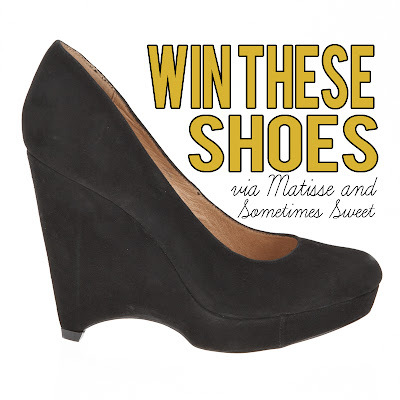 Up for grabs is the darling Monet wedge (a $150 value), courtesy of Matisse Footwear. The lucky winner will win their choice of color and size. 3) To gain up to two additional entries, you can blog or tweet about this giveaway, just be sure to leave another comment letting me know you did so, along with your name/email address again. That's it! You have up to three ways to win, and I'll choose a lucky lady one week from today. Good luck to all who enter! My favorite are the Dylan boots! Hello. My name is Amanda and my email is lalaleylee@aol.com. I am a recent follower of your blog. My favorites are the tattoo tuesdays as I am going for my second tattoo very soon and I am really excited. I have always loved them and found them beautiful but until recently couldn't afford or find a way to get one. Anyway. I tweeted about the contest and am following you on twitter also and my favorite would probably have to be the padock (tall boot) I love boots and find them to be my favorites. I also like some of the flats because of how feminine they are but they aren't my favorites so that's besides the point. Been following your blog for a while, keep up the good work! My favourites were the JOSIE wedge and the BRODY boots! I love the sparkly Adriana's. Pefect for work, but also great with a cute dress or jeans. And did I mention they were sparkly? i have been searching high and low for wedges to wear this fall! i LOVE those! I really like the there HENDRIX heel! Great giveaway! I love Gregor;they're the perfect summer flat! I am known as Sharithstars, found you on Instagram and I'm so diggin' your web design and blog entries! I actually did all three. I hope I'll be picked as one of your weekly winners. and in my blog entry I mentioned that I am in love with both the monet wedges and astor boots! I LOVE the Gaucho boots in brown!! So many to choose from! i like the lotus clogs in 'choco', super cute! Oh my gosh, the San Antonio boots look so much like my cowboy boots I had when I was little (except my boots were red, naturally). Love them! I love the OLIVER wedges! Love the Duncan boot in black! and i love the lovee!! My faves are the Bennett wedges! I really live the Thornbird boot, soo cute and a great price. My favourite is the LOVEE Slingback wedge. Would probably pair it with some nice shorts or a flirty dress. The Gregor is really cute in gold. I am a new Texan, so the San Antonio boots seem appropriate. Still warming up to the idea of cowboy boots! I really like the Prague boots! They remind me of riding boots and I love that. Oh wow, so many cute shoes! *drool* and these wedges are to die for! One of my faves from the site were the Dove boots in Cognac. The Asher wedges are so so cute! The Dove is my favorite! I am loving the PISA in blue. Anna- writingthislife@gmail.com. super cute shoes. i think my favorite pair has to be the whiskey colored Foxtrot boots! Love the EQUIS boot! Perfect for New England Falls! i love the hendrix or any of the boots. I have always loved this line of shoes! i LOVE the WYATT boot in brown or black! sooooo cute! I'm looking forward to fall, which means boots! I love the Prague boots. But, these wedges are great too. I like the Grifter boot for fall so cute! Do I have to just pick one?! They are all amazing! I really love the Wyatt Boot and the Monet Wedge. Lovely. the Dove is amazing, just the right amount of edge! my life would be complete with a pair of the foxtrot boots! I LOVE the Astor wedge boots. I really love the Middleton boot! I am always drawn to summer shoes so I am trying to focus on fall boots now and the Middleton is absolutely perfect! I think the Gretchen bootie would be perfect for fall! Yayyyyy for shoes! Since fall is on it's way, and boots are necessary for fall, I love the EQUIS boots. They are sa-weeettttt! I love the Beau wedges! I love the prague boots! perfect for fall. I was on the site for 20 minutes trying to pick. I'm so indecisive but honestly I love the Monets that the contest is for, my favorite pair of shoes like this just kicked the bucket and I've been trying to find a replacement so this is such perfect timing! I think the Dove boot (in leather cherry especially) is amazing! The monet wedge, for sure! Ok, those monet heels are awesome...also love the beau, and just about all the boots! I love the Middleton boot! I Love the Bennett wedge! I love the Arrow wedges! Wedges are my weekness. I'm a tall person so I'm definitely drawn toward the Tatum Flats! Ohh! I'm in love with the Lovee wedge! Caitlin, tomakelovestay [at] gmail [dot] com. I love the Breeze sandals! I love the thornbird boots! It's about to get all kinds of cold where I live so I'd have to go with one of their books. I love the Foxtrot. It's so simple and since it's flat I could actually wear it on the icy days. I also tweeted about it :). Torn between the Wyatt boot and the Monet that you have posted. besides these being possibly the cutest shoe ever, i love Satine as well! Cute shoes! I like the LOVEE wedges. They look like they'd go great with a sundress or jeans. Really I have to decide! There all so cute I just dont know. I love all the wedges and Im excited they make their sizes in 5's! I have small feet and it's hard to find my size, in cute shoes! Those Grifter boots are pretty groovy! The Victor ankle boot would be sooo great for fall! So would this wedge! I would rock it at the office, for sure. Thanks for the chance to win. The gaucho boots are amazing, and I'm not even country in the slightest! The beige Hendrix open toe heel is too cute! I love the Duncan boot! Perfect for going out when the weather is chilly! LOVE the Fox Trot boots in Brown! Wow, have to add these to my Christmas list (yes I've already started). I would live in those Gent booties! Perfect for fall/winter. I am dreaming of fall and therefore drooling over the Prague Tall boot! I'd love the Dove or Belfast boot! Annnnnnd I tweeted about it so my friends can enter too! I really like the Thornbird in micro tan. Perfect for the fall! I love the tatum in leopard!! Jillian Forzese @ forzesej@gmail.com and i choose the bravos baby!! I love the Paloma open toe wedge shoe! In gold it's so cute!! The Oliver Opentoe Wedges are perfect! I love the Bennett shoes! ooh, love the dove and wyatt boot! I am really into the Beau wedges! So pretty! yeah the monets are pretty awesome themselves, but I also love the Oliver open-toe wedges! soo cute. Their Dove boot is rocking my world. Amazing give away! the satine! i am a sucker for an adorable pair of kitten heels! I like the Gaucho boots the best because I'm a cowboy boot fan. Also this reminds me that I won a pair of shoes during shoe week but still haven't gotten them yet! i like the Paloma wedge. I love love the Bennett Wedge! So cute! OMG. So many to choose from, and I'd probably take every single one of them! Lordy. However, I do have a particular thing for wedges. God created wedges specifically for me. I'd love a pair of the Babylon wedges in black. So gorgeous. love these Damsel in cowhair black and also them in brown!! In a close second, these Tatum in leopard...LOVE! I love the Prague boots. Perfect for fall! Feeling Fall in my dreams and I am wearing the amazing Arctic Wedge Midboot. Loving them! Duncan or Monet in Black are my favorites from their website. Ooo I love the flirt flats! i love the hoax bootie! I love the Hendrix in white! I can already picture outfits with those shoes! All of their shoes are stinkin' cute. I love the Asher wedges in black! I have seen them before somewhere else. Their San Antonia boot is fantastic! Love all the shoe giveaways you've been doing! Gahhh! So many cute shoes!! I really like the Gaucho western boot & the Damsel heels! My favorite is the Brody boot. I really like the dayton boots! LOVE all of their boots, but really love the Florence boot the most. Great giveaway, thanks! Satine & hepburn...I couldn't pick just one fav! i love the wyatt boots in both colors! I especially love the Prospector boot in suede grey and the Thunder Road in black. Here goes!! I'm in love with the EQUIS tall boots! I love the Josie wedge. I adore so many of their shoes! I wish I could pull any of them off. I think the ones being given away ARE my favorite, but I also really like the Tatum, Josie and Astor! So many gorgeous ones! thank you for the opportunity! those wedges are super cute. I think that my favourite would have to be foxtrot brown boot. I am so jazzed to have discovered this brand. Amasing. Love the Dylan Boot! I would love to be entered into the contest for those gorgeous shoes. I love the gaucho boot! This is such an awesome giveaway! I love the Melody clog! It would be great with tights or skinny jeans! I love the Duncan boot! i <3 the presley in leather stone and the victor in black.. with my favorite having to be the victor. these are def going on my wishlist! andddd i just tweeted about this awesome giveaway @laurenashley201! I really love the Josie bootie. Cute shoes! I loooooooooove the gaucho boots. My favorites are the Presley Booties and the Foxtrot boots! My favorite is definitely he Monet wedges - i just saw a girl wearing these the other day and instantly fell in love. I'd love to win them! My favorite shoe on the Matisse website is the Monet wedge heel! I'm a wedge junkie! I love the Billie heel! So cute.